There are so many different kinds of canvas and material to cross stitch on. The majority of people only think of the two most popular; Aida fabric and linen. Why not try something new and create a different type of project with Waste Canvas. Waste Canvas is so versatile. It can be used on fabrics that are harder to stitch on, like knits and small weave cottons. What is waste canvas? Is it hard to use? Check out the info about Waste Canvas below and see if it is the fabric for you. Waste canvas is a grid that is held together with a water soluble glue. Waste canvas resembles the canvas used for needlepoint. It is available in various fabric counts, typically 8.5, 10, 14, and 18 squares per inch. A blue thread is often woven every 10 stitches to help with counting. This gridded canvas is called waste canvas because the fibers are temporary and are pulled out after the stitched design is complete. Newer versions of waste canvas have been designed to completely dissolve in warm water. Waste canvas is used to stitch on non-evenweave fabric. Stitchers use it to aid in stitching on clothing, tote bags, quilts, and other non-evenweave material. The grid guides stitch placement. After a design is completed, the grid is moistened and removed, leaving the finished design in place. The latest versions of waste canvas have the canvas dissolving completely instead of taking out each thread like was done in the past. There is also waste canvas that presses onto the fabric so you no longer have to anchor it onto the fabric. This takes a lot of headache out of the equation. This also allows you to use the waste canvas on different fabrics. Don't limit yourself just cotton fabrics, try knits and silks. The canvas should be cut slightly larger than the finished design size of the design to be stitched. Mark the center of the waste canvas with a small piece of floss or a permanent marker. Attach the waste canvas by basting it onto the pre-washed fabric. When the design is complete, remove the basting. Moisten the waste canvas grid and remove it, pulling each strand with tweezers or by hand. Use a crewel needle instead of a tapestry needle. You may want to baste a piece of interfacing on the back of the fabric for additional support.Now they offer waste canvas with a sticky back that will allow you to press and seal the waste canvas to the fabric. This is perfect for silks and other less stable fabrics. Stitches should "hold hands." There should be no gaps. Stitch into the middle of the square formed by the grid of the waste canvas. Take time to position your stitches carefully when working with waste canvas.Your waste canvas can move so make sure that you have it anchored to the fabric otherwise the stitches will not be solid and be raised. The canvas should be moistened, not doused with water. Too much water may actually make it more difficult to remove the waste canvas grids. Use high quality floss when cross stitching with waste canvas. Test your floss before stitching to make sure that it does not bleed onto the fabric when submerged into water. Care should be taken when basting the waste canvas on an item that will be worn. Use pins to help mark the center of the area you will stitch to match it to the center of the canvas. Make sure the canvas is placed exactly to ensure stitching success. 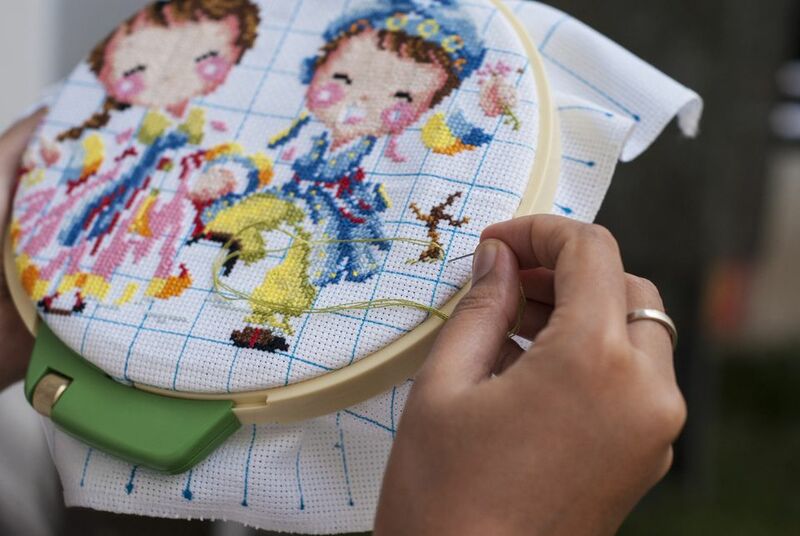 Waste canvas is a great way to take your cross stitch to another level. You can use it to decorate clothes, sheets, pillow cases and tablecloths, just to name a few. It does take a bit of getting use to but once you have the feel of the canvas down, nothing will stop you.